Selection of the laparoscopic approach is based upon tumor location to ensure adequate surgical exposure. The transperitoneal approach is preferred for anterior, anteriolateral, lateral, and apical tumors. The retroperitoneal approach is reserved for posterior or posterolateral tumors. The Cleveland Clinic technique of laparoscopic partial nephrectomy has been described previously (2). Operative steps include renal hilum cross-clamping after kidney mobilization and exposure of the tumor. 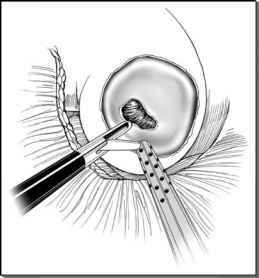 Temporary hilar control provides a dry surgical field essential for accurate tumor excision and kidney reconstruction.